When GeneviÃ©ve McMaster wrote the Caribbean Primary Exit Assessment (CPEA) exam in May, she expected to do well, but did not expect to place first for girls and second overall. 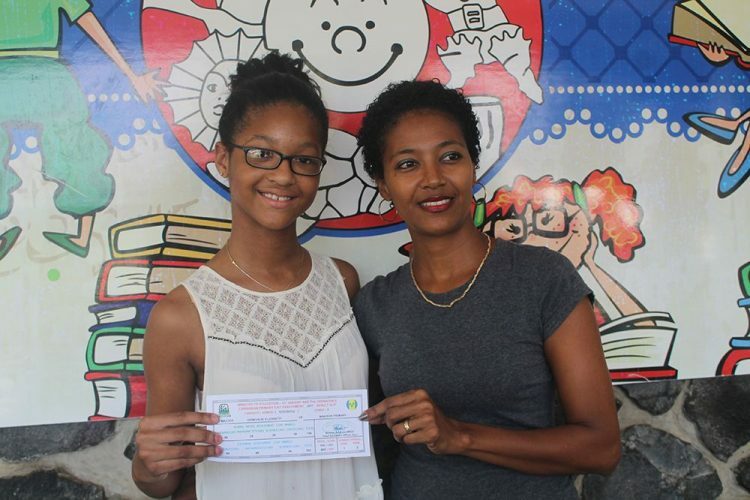 Speaking at her school, the Windsor Primary School on Monday, the 11-year-old Dorsetshire Hill resident said she was very pleased when she received her results. âI expected to place high, but not this high,â she said. GeneviÃ©veâs average of 97.60 per cent and first place for girls tied her with Chenise Harper of the St Maryâs Roman Catholic School. GeneviÃ©ve said that to prepare for the exams she revised and practiced using past papers. The lass stated that while she does not know yet what career she would like to pursue, she knows she wants to work in the field of Art or Engineering. In an interview with Searchlight, Elizabeth McMaster, mother of GeneviÃ©ve, said that neither she nor her husband had to restrict any of her daughterâs activities during her studies. Elizabeth stated that while her initial plan was to help her daughter with her studies, she couldnât because of circumstances beyond her control. âA lot of prayer went in and thatâs the part that I played in her life,â the proud mother said. As a reward for her outstanding performance in the CPEA, Elizabeth said that a trip to France might be in her daughterâs future, since she has always wanted to visit that European country.